Voted #1 Peoples' Choice Golf Course in the Gladwin Area for over 15 years... and counting! 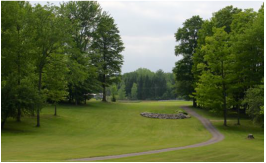 Gladwin Heights, a family owned and operated course, is located 20 minutes from Midland. The course is a charming, well-maintained 18-hole course with rolling hills and tree lined fairways. Golfers of all levels will enjoy the competitive layout. We are committed to providing our golfers with a fun and enjoyable golf experience! The front 9 plays to 2725 yards. This may seem short, but this is the shot makers’ side. Straight tee shots and accurate approach shots are paramount. 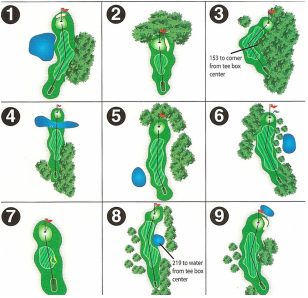 Five of nine holes have strategically placed bunkers, and water comes into play on holes 1,4,6 and 8. Number 4 is a par 5 playing only 413 yards. Once you have executed a demanding tee shot, it will leave you a short 2nd shot to the green for a possible eagle. With a little patience you can go low on the front side! Holes 10 through 18 play to 3170 yards for a total of 5895 yards. The back side is more open with larger landing areas for your tee shots. Six holes have sand in play, but only two have water in play. 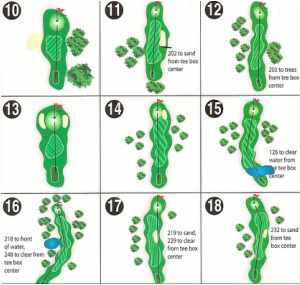 With larger greens, don’t underestimate the subtle, but not too subtle, breaks that make putting a challenge! Number 16 dogleg left around a water hazard at 549 yards makes par a good score. Enjoy!! Every Friday we have a scramble. 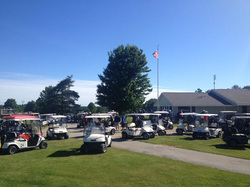 Shotgun start at 10:00, cost is $25.00 includes 18 holes with cart. Golfers of all levels are welcome, it’s a great way to meet new people. Bring a foursome or come as a single! Gladwin Heights can accommodate outings of all sizes, from family reunions to corporate outings. Our friendly staff, competitive rates and well maintained course will make your event a success. Our full size practice range and putting area is a perfect place to sharpen your skills before each round. The perfect gift for the golfer. Stop by and pick up a certificate for greens fees or merchandise from our pro shop. Or call 989.426.9941 for information.